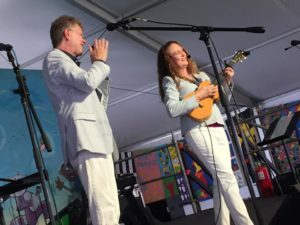 We had a fabulous time performing in the Kids Tent at the New Orleans Jazz & Heritage Festival last weekend. We knew it was going to be a special day when among our amazing fans in the audience were musicians Irma Thomas, Tom Fisher, Jason Mingledorff and Matt Lemmler, as well as writer Michael Tisserand and photographer Pat Jolly. Then when Irma Thomas and her daughter Tina started dancing the Cajun two-step with the other families to our "Bon Jour Mes Amis" song, we knew it was going to be memorable - one of those "only in New Orleans" moments. Thanks to all of our fans and friends who made this Jazz Fest performance one of the best yet!